With a spectacular two hour light show that accompanied the first concert, Hamburg’s new concert hall and landmark, the Elbphilharmonie, was opened yesterday evening. This marks the end of a difficult, 14 year long planning and construction process and the beginning of a new era for Hamburg. Hamburg is a city that is known as being traditionally cautious and restrained in many aspects, architecture and city planning among them. Great visions don’t happen often in Hamburg. Yet in the time when the Elbphilharmonie was proposed, suddenly this visionary, bold proposal caught on. No sooner or later could the idea for this daring project have developed the momentum it had back then. Initially proposed by a private developer as an alternative to an office building originally planned for that plot, the City of Hamburg itself took over and made this project a priority. Granted, had there been a public referendum about whether the Elbphilharmonie should be built, it wouldn’t be here today. Hamburg’s inhabitants have shown their general pessimism last year when they voted against Hamburg’s application for the Olympic Games 2024. Daring proposals and visionary ideas are almost always met with heavy opposition, not just in Hamburg. In that respect, it truly is a wonder that we can see this concert hall standing there now, right in front of our eyes, a vision turned reality. Lots has been said and written about the difficult planning and construction process. Yes, the Elbphilharmonie’s original cost estimates were heavily sugarcoated, the 77 million Euro that media still report as the original price were absurd to begin with. Nobody with any knowledge of architecture would believe that you could get a building of this scale and magnitude for such a low price tag. This is not some run-of-the-mill architecture, it is an entirely unique building for which almost everything had to be specially designed. The architects Herzog & de Meuron estimated the cost to 400 million Euros. 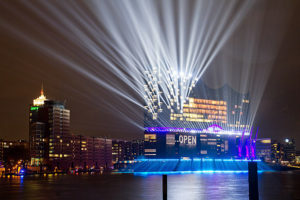 At the opening of the Elbphilharmonie Plaza on November 4, 2016, Hamburg mayor Olaf Scholz said that without the delays and lawsuits, the building would have cost around 500 to 600 million. These are reasonable numbers I guess and if you take these into consideration, then the building’s final 865 million price tag (of which 789 million are paid by the city of Hamburg) is far from the tenfold increase that is still widely cited. But these numbers will become irrelevant over time anyway. And it is probably not even possible to calculate the benefit that the Elbphilharmonie will bring to the city as a whole, not just economically, but also in tourism and in promoting the city worldwide. The New York Times recently called Hamburg one of the top travel destinations of the year 2017, specifically mentioning the spectacular new concert hall and calling Hamburg a top spot for design and architecture. Now, Hamburg has a building like it has never seen before. It is a building on a new level in scale, in magnitude, in grandeur. A beautiful building? The opinions are divided on this. But definitions of beauty change over time. From now on, this building – just like any other that is being built today – will influence our perception of architecture and our definition of beauty, which constantly changes and evolves, albeit this is naturally a slow process. People called St Paul’s Cathedral in London an eyesore when it was built. Nobody would say the same about it today. It could well be that in a hundred or two hundred years, people will say about the Elbphilharmonie that “back then, people built still really beautiful buildings”. It might also be that people will look at this building and say that “in the early 21st century, society had a high value of culture, erecting grand cultural buildings like this”. Sounds familiar? These are common sentences you tend to hear about the architecture of former eras. Maybe it all comes around in the end. We’ll have to wait and see. The true story of this building begins now.